The lion’s share of the attention directed at Upgrade’s stand surrounded the new Kinesis builds, shown for the first time at Core. The Tripster Ace, retailing at £799, is touted as a commuter or explorer build. Built around the existing and much loved alloy Tripster frame and specced with disc brakes, there’s eyelets for racks and guards. Kinesis’ own brand wheels, as well as Upgrade’s Freedom tyre brand, keep things rolling, while a flat bar allows for a more upright riding position for navigating the streets. There’s three more introductions on the frame front too, with a Gran Fondo Sportive sample in titanium on display. The production model will take up to a 28c tyre. At the entry price point, the £499.99 Crosslight ST is now available in youth frame sizes for those dads taking their kids along for the weekend races. 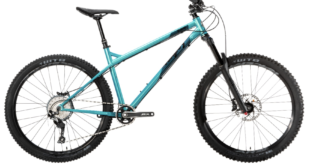 On the MTB front the eyecatcher came in the form of the Maxlight FF29, which for Core was built with a “27.5 plus” wheel. Upgrade will carry stock of the rims and tyres, which it will offer to build to Maxlight convertible hubs until complete WTB wheelsets become available. discs, both frame and fork will have flat mounts that won’t make the bike look ugly should your customer go down the traditional route. Meanwhile, DMR has a new V6, this time a 327 gram plastic pedal running on bushings and set to be available in eight colours. Drawn in by the smell of fresh coffee, many will have stayed a while to check out the 2015 Merckx range, which is now represented by 2pure in the UK following the separation with the Neil Pryde label. Celebrating its 70th anniversary this year, the marketing push is imminent and dealers are still sought despite a strong sign up both pre and during Core. £5,249 or Werx package at £6,299, the HD offers 6-inches of rear wheel travel based around the DW-link suspension platform. The carbon monocoque frame’s kitted out for internal routing for dropper posts and offers a removable direct mount for either a front derailleur or single cog up front. 2pure believes it’ll be a big year for Rolf Prima, with the Vigor Alpha wheelset in particular proving a big hit. Described as the fastest alloy wheel in the world, the £999.99 pair has been tested against all the big brands and delivered the result “at all angles” not just upright. Another bold claim is that in testing the wheels have conquered the Strathpuffer and multiple other epic off road rides without the need for a re-true. POC’s Race Day kit, as worn by Cannondale Garmin Sharp, will hit stocks in March for those stocking the popular label’s garments. Interestingly, in tests, the dimpled top-end shoe covers offer more of an advantage in wattage boosting terms than a pair of high-end wheels when it comes to aerodynamics. 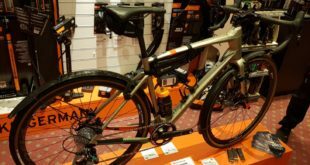 New brands galore for Ison, with first looks at lighting label Gloworm, pedal specialist HT Components, Sarma’s fatbike catalogue and Apidura’s luggage. Gloworm present a nice alternative to the competition, boasting the smallest 2,000 plus lumen light on the market at present, as well as some clever tech built in. Uniquely, customers can tailor their output with a few clicks. There’s also no danger of overheating thanks to a chip within that senses temperature and adjusts output should the unit get past 70 degrees. House brand The Light Blue had some eye-catchers on display, most notably a prototype Darwin Twin Peak, expected in stock during summer. 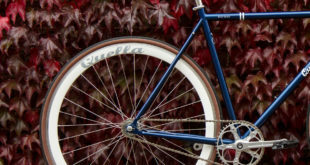 Built to accommodate either a Rohloff Speedhub or a traditional setup, various builds will be on offer when stock lands. The retro catalogue has also been given an overhaul and is well worth recommending to the tourer looking for a stand out build. Finally, MRP has introduced a Wave ring that will hit the UK in the course of the next two months. The tooth profiling will see the chain flex around the teeth improving the sprocket’s durability without affecting chain wear. Folding bike dealers are to be treated to new point of sale with a stylish and modular unit from Tern now available. Stackable three high or horizontal, the display units are available to those dealers committed to Tern. Those dealing in high-end road would have headed straight for Fast Forward, in particular the F4R DT180 Carbon Silver Edition Tubular. Based on the F4R tubular rim this set comes with a special outlined silver logo matching the hub log (£2,175). 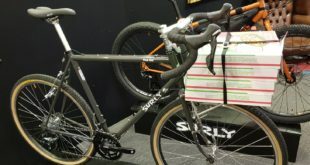 The distributor is also one of a few in the industry scouring the pages of Kickstarter looking for the next innovation and BikeBiz spotted a snap open and closed mudguard that could soon be making waves.